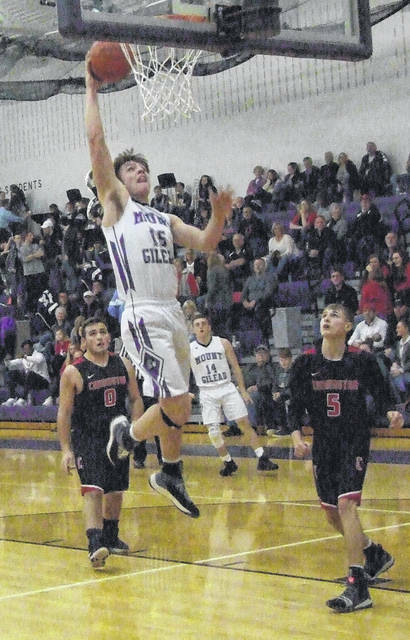 Mason Mollohan goes up for a quick two points against Cardington, as Mount Gilead defeated the visiting Pirates Friday night. Cardington’s Danny Vaught looks to connect on a short-range jumper against Mount Gilead on Friday. 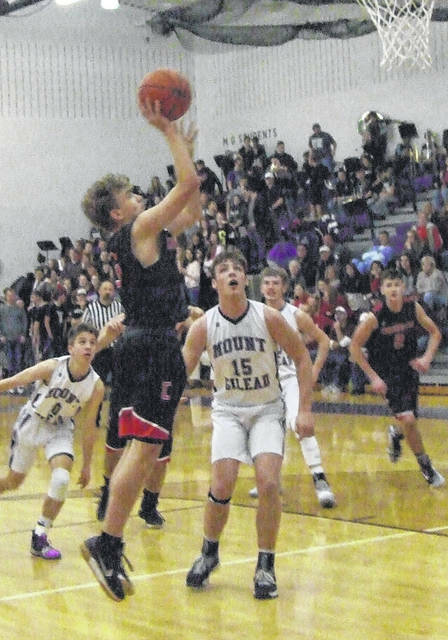 Scoring droughts proved fatal to Cardington when they traveled up U.S. 42 to Mount Gilead Friday night for a boys’ basketball game. In MG’s 62-43 win, the Pirates suffered droughts of three minutes or more in each of the first three quarters — stretches in which they were outscored by a total of 21 points. The first drought happened after a Trey Brininger basket in the first quarter brought Cardington within a 5-4 margin with 6:42 left in the period. However, the team would not score again until getting a free throw by Avery Harper at the 3:26 mark. During that stretch, the Indians got a free throw from Mason Mollohan and two points each from Adam Linder and Liam Dennis to get a bit of breathing room. Three-pointers by Brininger and Josh Shook were able to bring the Pirates within a 14-12 score early in the second period, but the Indians would explode offensively, getting baskets from Linder, Nick Dyer, Brandon Stevens and Mollohan in quick succession to open up a 10-point lead. While the Pirates were able to ride three-pointers by Shook and Danny Vaught in closing within a 24-20 margin with 3:49 remaining in the second, they would not score again before intermission. The Indians used that time to solidify their lead, getting four points by Mollohan and a late three-pointer from Jackson Huffer to lead by 11 at the half. Linder opened the third quarter with a basket, but Cardington responded with a 6-3 run sparked by four Garrett Linkous points to get back within 10 at 36-26. Unfortunately for the Pirates, another scoring drought allowed MG to open up a commanding lead. Mollohan did all the damage, as he opened his team’s run with a three-pointer and then added a basket and four three throws to boost his team’s lead to a 45-26 margin. While Cardington finished the quarter with six straight points on baskets by Vaught, Harper and Brininger, MG still led by 13 going into the final period. Withrow added that Mollohan was a tough player for his team’s defense to handle. A fast start to the fourth quarter by the Indians put an end to any possible comeback hope that Cardington had. A basket by Brad Landon and two free throws each by Dyer and Linder allowed them to stretch their lead to a 51-34 margin with four minutes remaining and they were able to maintain a lead of at least 14 points the rest of the way. Mollohan led all scorers with a 27-point outing, while both Linder and Huffer had eight. Cardington got 13 from Vaught and 11 more from Brininger. As the second half of the league season gets ready to begin, both coaches were hoping for their teams to continue improving throughout the remainder of their games. Strasser hopes that getting a much-needed KMAC win will help catapult his team up in the KMAC standings.